Smt. Nilam Gautam Patel is born on 16th November 1944 in Ahmedabad. She has obtained the Gujarat University Ahmedabad the degree of M.A from S.N.D.T. women University Mumbai and the degree of M.Phil. from Gujarat Vidyapeeth, Ahmedabad. She has visited U.K., U.S.A. Canada Italy, France, Germany, Switzerland etc. Dr. Gautam Vadilal Patel is born on 4th August, 1936 in Ahmedabad. 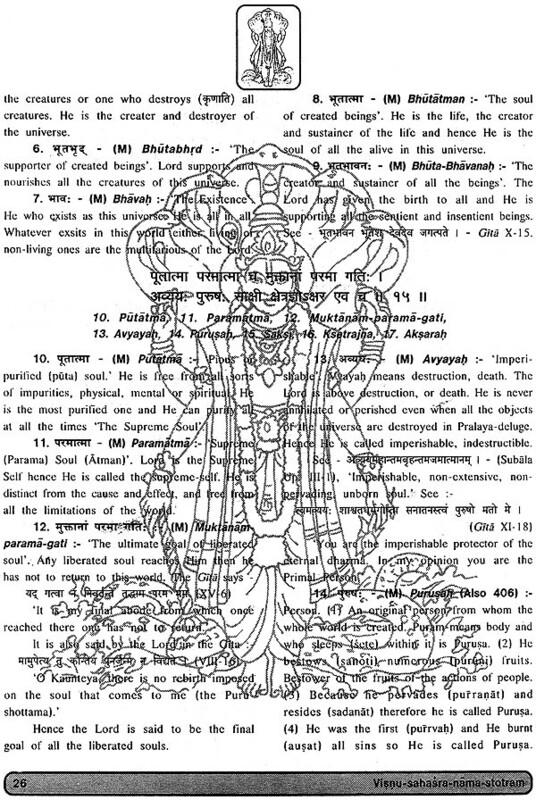 He is the disciple of Anantshri Vibhushit Swami Shri Gangeshwaranandji Maharaj Udasin. He has obtained the degrees of MA. and Ph.D. in Sanskrit from the Gujarat University. 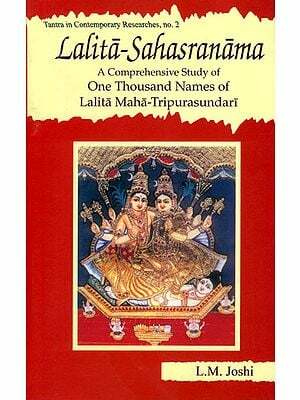 “A critical edition of the commentary of Vallabhadeva on Kumãrasambhavam of Kãlidasa” is the subject of his Ph.D. degree. Dr. Gautam Patel. joined as a lecturer in Sanskrit at St. Xavier’s college in 1959 and retired as the Head of the Department of Sanskrit in the year 1996 after 37 years service. Dr. Gautam Patel has written as well as edited more than 100 books either alone or in collaboration of others. 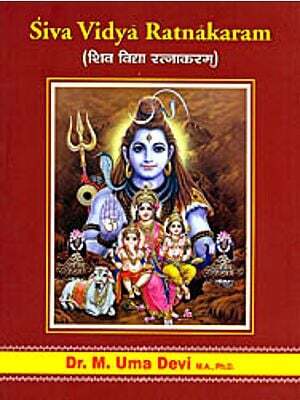 The books are written or edited either English, Sanskrit, Hindi or Gujarati. He has more than 60 research papers and 200 articles at his credit. Dr, Gautam Patel is often interviewed on Doordarshan, Akashwani, B.B.C., Voice of German Democratic Republic, Chicago Radio, Spectrum Radio (London) and Voice of Africa. He has given more than 200 radio or T.V. talks at various places in India and abroad. Dr. Gautam Patel has visited Africa, Nepal, U.K., U.S.A., Canada, Italy, France, The Netherlands, Austria, Germany, Switzerland, etc. either to deliver lectures or to attain international conferences. At present he is the President of Sanskrit Sahitya Akademi, Gujarat State, Founder President of Sanskrit Seva Samiti, Ahmedabad, Gujarat and a Chairman of All India Federation of Sanskrit Sahitya Akademies, New Delhi. Dr Gautam Patel is honoured by the President of India in the year 1997 for his contribution in the field of Sanskrit. Tell me a virtue or a quality of the Highest Reality i.e. 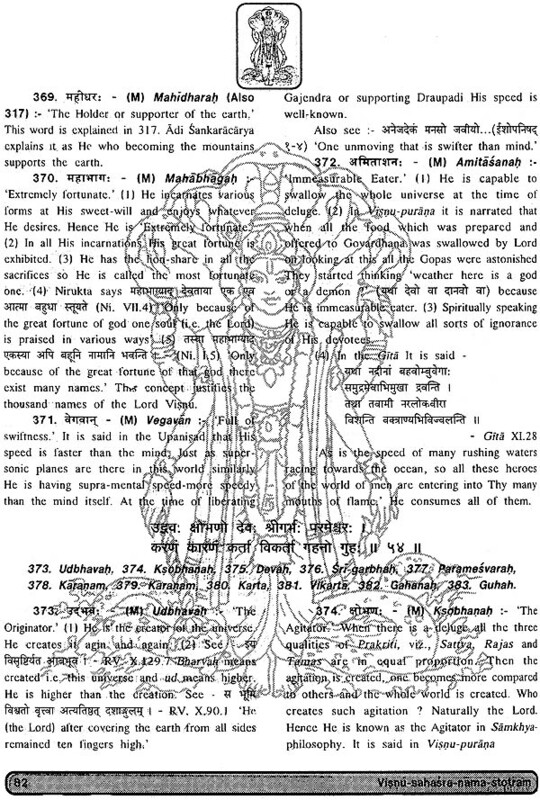 GOD (G z Generator, O Operator anti D Destroyer of the universe) according to any religion or faith of the world of any lime at any place and I can easily trace it in the names of the Lord Visnu as narrated in Visnu Sahasra ’nãma- stotra of the Mahabharata Late Vinoba Bhave has traced the parallels of all the epithets of Allah as narrated in Muslim Religion One can find such parallels of other religion top Thu&amp; in this serise Visnu-sahara-náma-stotra is universal. 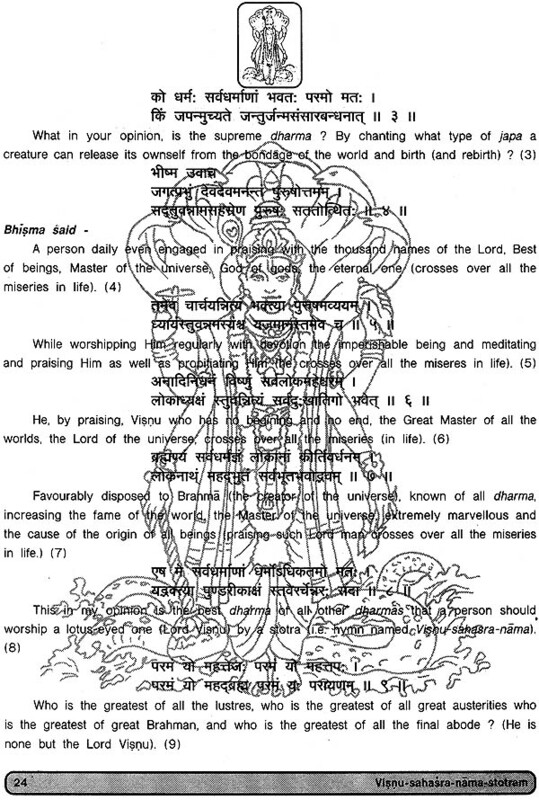 All most all the religions of the world ha accepted the existence of some world other than this physically visible one. At’ the same time the followers of any religion have full faith in some Higher Reality. This Higher Reality designated by numerous names by various faiths is none but one and only one. This Higher Reality as per the faith of the followers is the root cause for the creêt1cr1 maintenance and the destruction of this universe. This is the result of the faith, the basic quality of a human being. 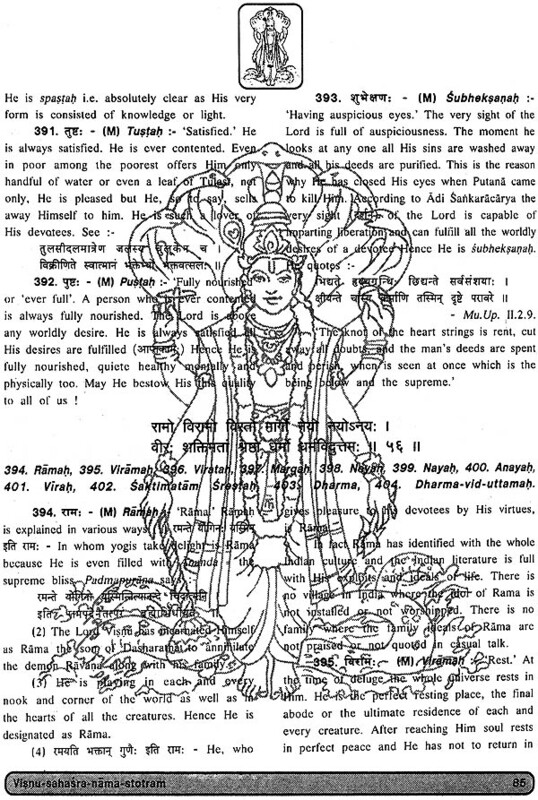 All man are full of faith: No one in this universe be without faith Hence Bhagavad- Gita has proclaimed that this,’ human being is full of faith ‘Visnu-sahasra-nama - stotra is the outcome of such deep faith. Adi Sankaracarya has written a commentary in Sanskrit, Here I have tried to explain it in English. I have also banked upon other sources too I ‘thank all my predecessors in this flew and acknowledge my indebtedness to them. Shri Praful Amin and Smt ‘Chandrika Amin and Shri Narendra Patel arid Smt. Jayshri Patel are solely responsible for ‘bringing out this edition English, mainly for the people who are residing outside India, Without their assistance arid encouragement this book might have not seen the day-light, I take this opportunity to thank Smt. Saryu Patel who is responsible to introduce me to these dignitaries. I thank them whole heartedly. I feel lucky and find nothing but the grace of God as I was fortunate enough to enjoy their generous and loving hospitality during my stay at Birmingham. U.K. May God bless them and jet they be more fortunate in Sponsoring such more lasting benivolent activities I need not forget ‘Shri Mahendralal Shah and Smt. Malniben Shah who have sponsored Gujarati edition of Visnu-sahasra-nama-stotra. I am highly thankful to Mr. Yaduvir Rawat and Mr D R GehIot, (Director of ASI, Vadodara circle) for giving me permission and supplying necessary ‘material of Dasavatara of Lord Visnu especially of Rani-ki-Vav of Patan, I am happy to note the help in finalising Shri Hasmukhbhai Dave who has spared go pains in bringing out this book White my love and affection have increased for my’ beloved student Dr. Urmi Shah, now Universally accepted scholar of Sanskrit Language and Literature, as she has most willingly rendered all the help which J have claimed from her, May Atmighty shower His choisest blessings upon her, Prof Ravindra Khandwala, Mr. Naranbhai Patel and Mr Milind Dave arid Mr Naushil shah of Pratikruti also deserved thaks for their help, Mr. Yogesh Desai of Gujarat Offset Ltd deserves special thanks for bringing out this volume in a beautiful manner. Let ‘alt be happy and let all may cultivate the sense of equality for all irrespective f cast, creed, country or condition. 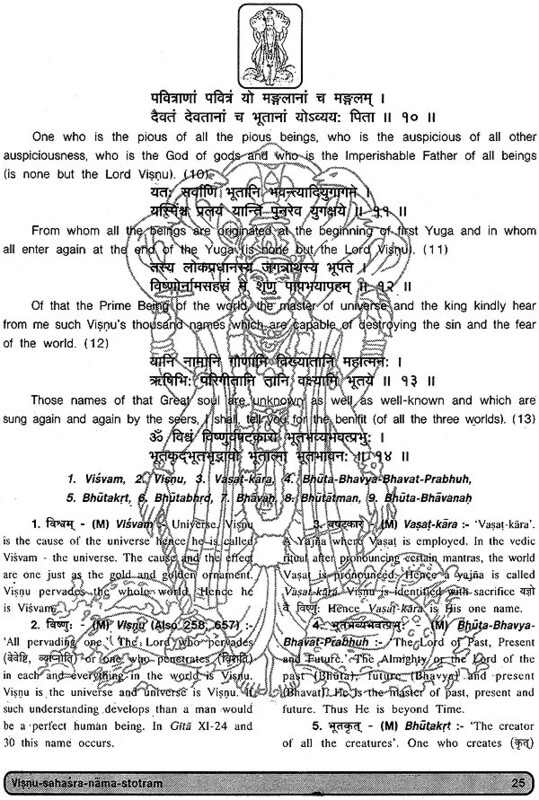 After all Equal attitude to all is the worship of the Lord Visnu. 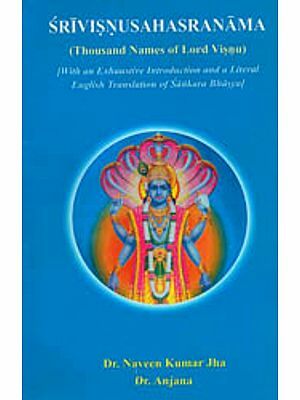 According to a legend about the life of Adi Sarkarácãrya the commentary On Visnu-sahasra-nãma (VSN) was the first commentary which he wrote at an early age. Everyday he was writing something on the board but Sarasvati, the Goddess of Learning, was rubbing it out. When he started wrings the commentary on VSN, Goddess Sarasváti stopped rubbing it out. 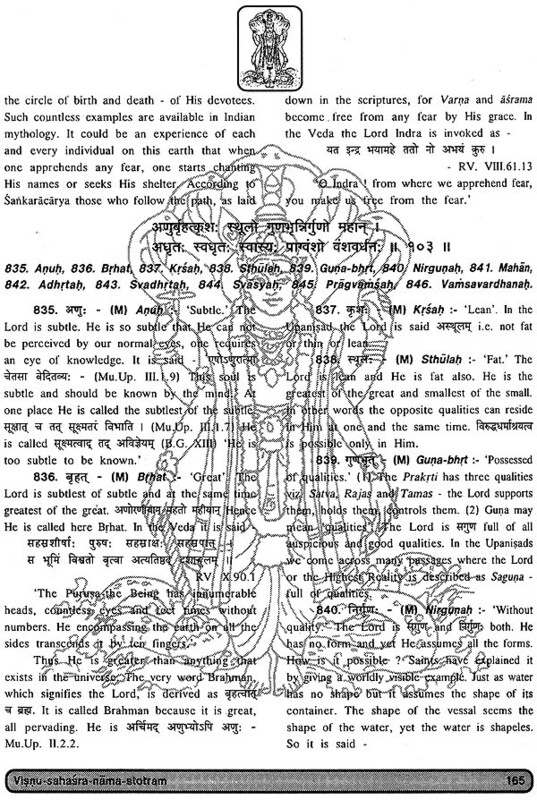 Adi Sarkarãcãrya has written ‘One should chant bhagavad Gitá and Visnu-sahasra-náma’ This proves that Gitã and VSN have equal importance according to him. 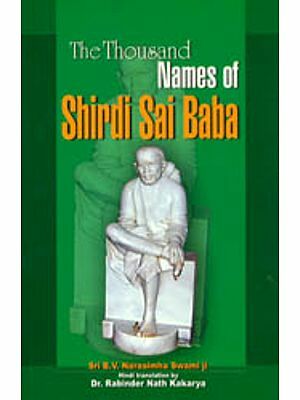 Even today from Kanyakumari to Kashmir and from Dwarka to Jagannathpuri there are crores of people?’ who daily recite these thousand names of the Lord Visnu with great love, devotion, reverence and faith, and obtain the desired , objects too. If they are chanted While knowing their proper meanings, they would be much more’ interesting. Hence Adi Sañkarácárya commented upon them in very minute detail. 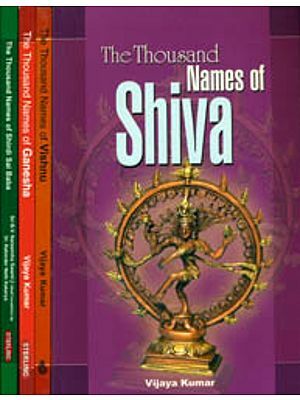 Sometimes one and the same name is derived by him from different roots and instances are not wanting where numerous meaning Of one name are traced by him. This is due to the genius of the commentator like Adi Sankarácarya On one hand and the beauty’ and the capacity of Sanskrit language on the other. According to the Indian Mythology as well as religious faith and belief, one and the same truth is named in different manners by scholars. 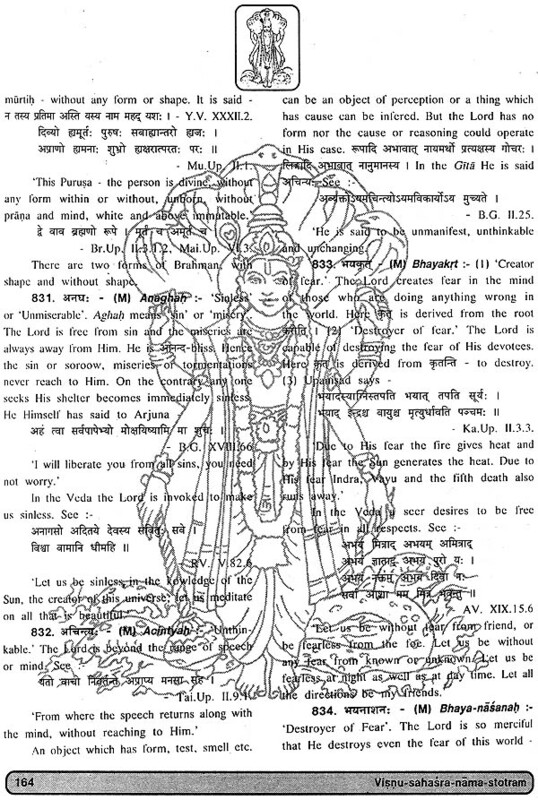 Yaska, the writer of Nirukta, has (Ni. 1.1 .5) ‘Due to the great fortune of that great diety (Got! there exist numerous names of one and the only one.’ In fact, the Highest Reality is one but the scholars give numerous names to that Reality At times people quarrel only to give names to It but That Reality’s one and only one. It is one without second. 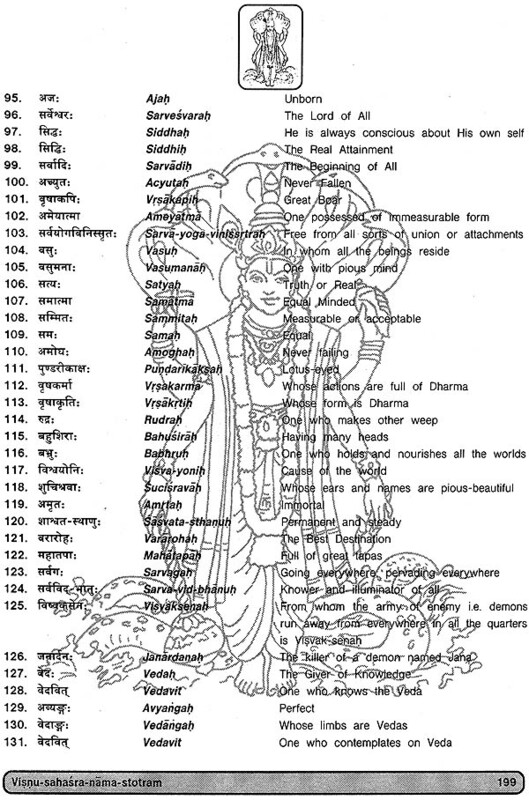 Such efforts of the scholars have resulted into the thousand names of Visnu, diva, Gopàla, Lalit, Hanuman and so on. It is believed that the name of a person and the person himself are identical. 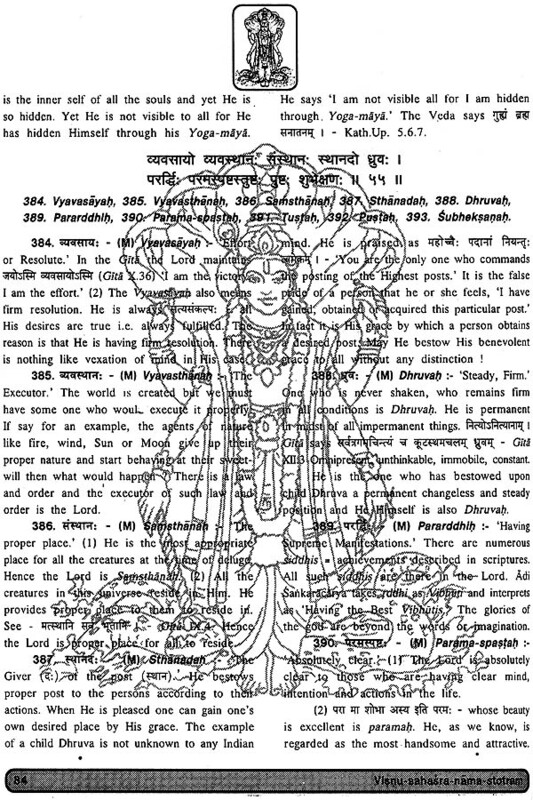 When one chants the names of his choicest Lord, the Lord Himself manifests before him. 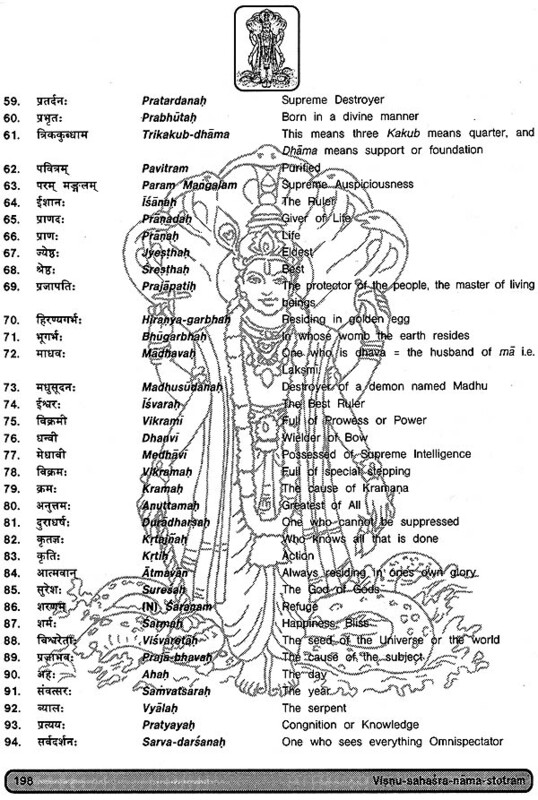 This is the aim and the objective of providing us .with the thousand names of our deity. 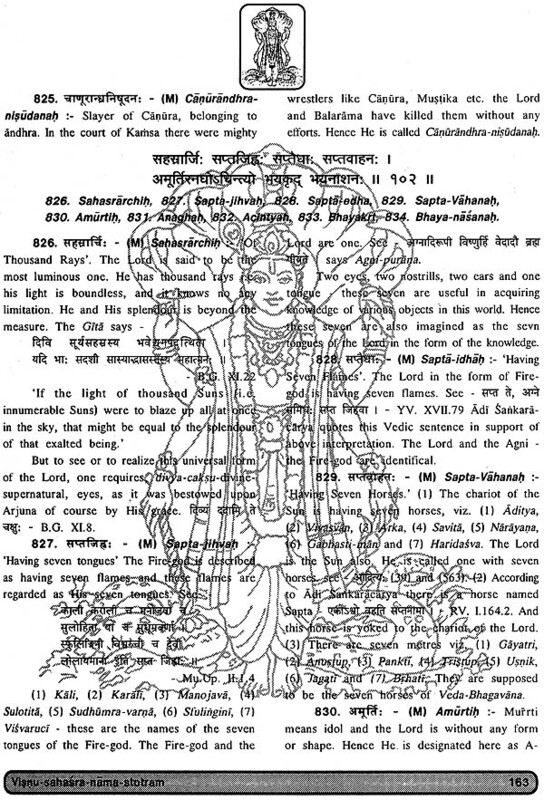 Visnu-Sahasra-nãma occurs in the 149th chapter of Anusäsana Parva of the Mahabharata written by Veda Vyäsa. Its background is worth noting Yudhisthira, the eldest Pandava, was most unhappy even after winning the Mahabharata war He had lost almost all his relatives, friends, followers, soldiers and servants, This situation was tormenting him very much For him, the victory was no better than defeat. He sought the shelter of his friend, philosopher and guide, Lord Krishna, But He advised him to go to Bhisma, who was laying on the bed of arrows Yudhisthira went to Bhisma and asked certain questions which Bhisma answered in very minute details. 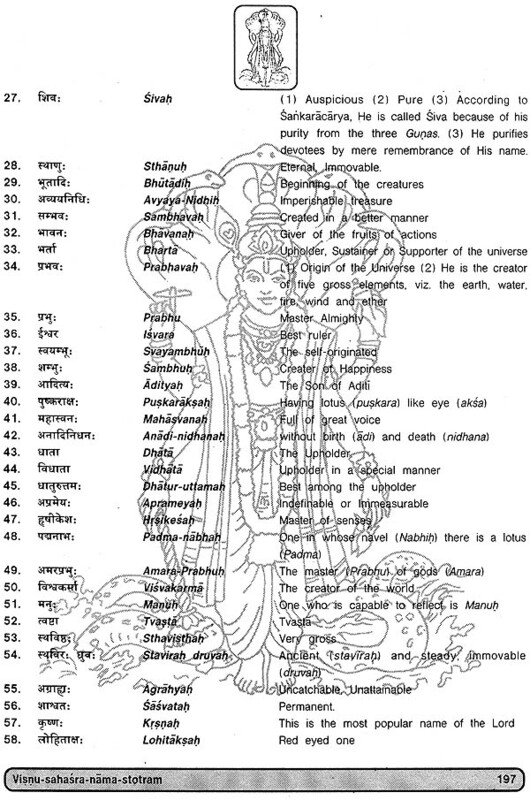 During this conversation Visnu- sahasra-nãma-stotra was narrated by Bhisma. 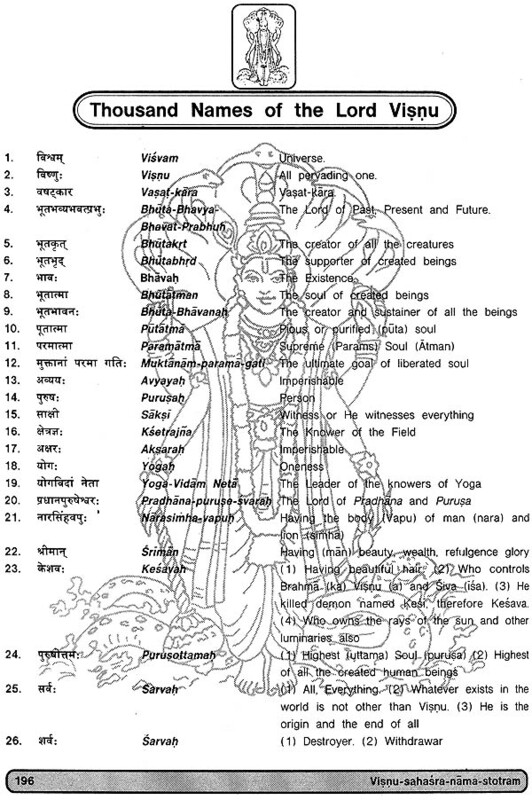 The chanting of the names of the Lord occupies a unique position in Indian tradition, Some people do not understand its re&amp; meaning hence they do put an interrogation mark on it like one foreigner who once asked an Indian Saint, ‘What’ is the meaning of chanting again and again the one and the same name, like Rama Rama? The Saint easily read the mind of this foreigner, that he wanted to degrade Indian religion and culture. So lust So teach him a lesion the Indian Saint, instead of giving any straight toward answer, said loudly, ‘You idiot ‘ The result was obvious. The foreigner became angry. He stood up from his Seat and started vomiting out his anger, You, the Indian Saint 1 you do not have manners. am just asking you a question and you are abusing me I Is this your culture? It is this that your religion has taught you? The Saint was cool and calm. He was smiling as if nothing had happened. 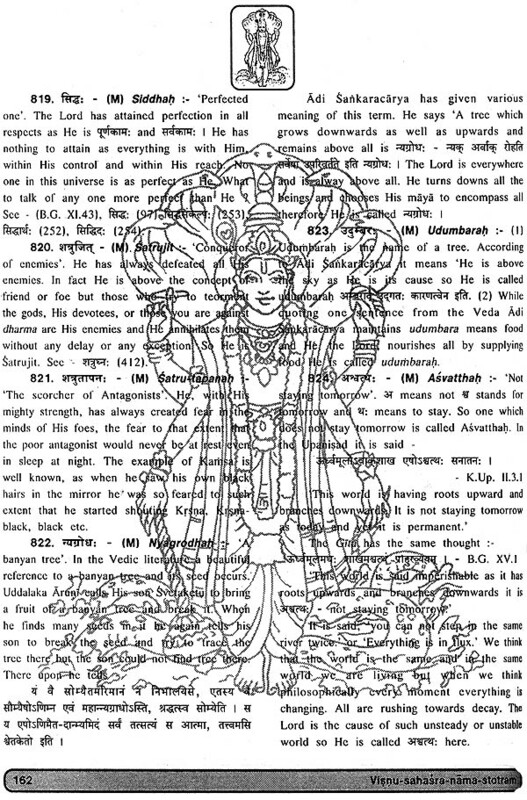 He, then slowly, requested that gentleman to calm down and said ‘Well, Sir if an abuse like idiot’ has the capacity to compel you to get up from your seat then it I chant, with love and devotion, The names of Rama, will he not come to me to liberate me from the bondages of the world has a special Power if you use it fl a proper manner at e proper place with proper intention, it would then definitely yield the desired it l’ The foreigner had to give up his prejudice on hearing this. If the chanting of the names of the Lord is coupled with the love and devotion, the deity is bound to reciprocate to the devotee with love. It is the universal law that love begets love Even the Lord, who is love incarnated cannot be an exception to this general rule. The word which you pronounce is eternal it never dies and at the same time pervades the whole universe. This is the principle proclaimed by the ancient Indian sages. Modern science has proved that when Word is pronounced, it pervades the whole world immediately. A cricket match is going or in Bombay The bowler balls and the batsman hits the ball The sound created by the hitting is heard on radio or television by a person in England and in Australia at the same time What does it prove 7 Sound universal It pervades the whole world the moment it is Uttered. The second principle, namely, the word, once spoken, never dies. Modern science has yet to reach this stage to prove this. But according to the Indian sages of the past, the word is eternal, the word is universal. 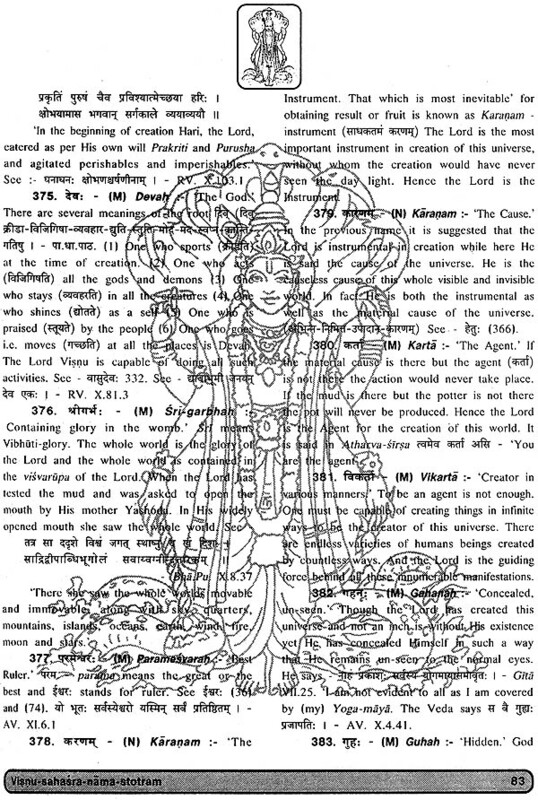 So when you pronounce the name of the Lord, you ace uniting with eternity and universality arid thereby you are uniting with the university Lord, who is eternal Hence the chanting of the names of your beloved God is the worship which leads you to eternity and universality, Hence said to be the best form of Lord Visnu.